Since most customers require insulation in addition to drywall, we make it easy and provide both services! The type of insulation you need depends on where it will be installed, what R-values are required and your budget. Products with a higher R-value provide better insulation. 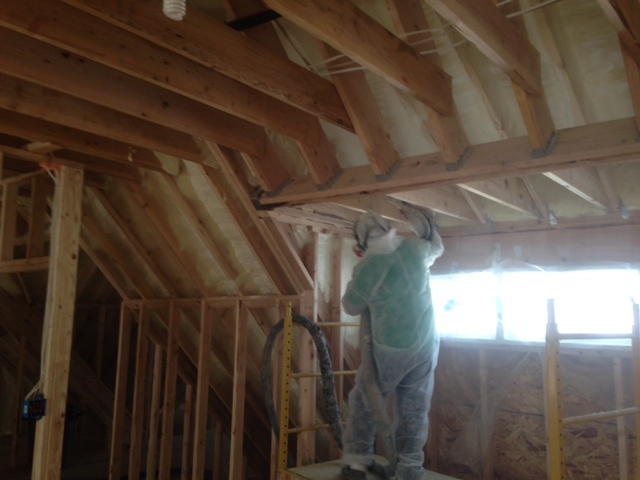 Spray foam is applied using a specific spray applicator―resulting in a thermal, air and moisture barrier. Open cell foams are low density, while closed cell foams are higher density. Fiberglass batts and rolls come in different thicknesses, R-values and widths to accommodate walls, attics and crawl spaces. You can either choose a roll or pre-cut batts for your insulation. Different R-values are available based on the location and needs of your project. R-values range from R-11 to R-38. The Blown-In Blanket® system or the BIBS® system is a proven, state-of-the-art insulation system utilizing specially manufactured fiberglass blowing wools installed in the walls, floors, attics, or ceilings behind a proprietary fabric. This is ideal for attics and hard to reach areas. Fire Stopping - A firestop is a fire protection system made of various components used to seal openings and joints in a fire-resistance rated wall or floor assemblies.